Full of goodness with leek and white bean, the vegetarian pasta recipe is ready in less than 30 minutes. Heat 1 tbsp of the olive oil and the butter in a large frying pan over a low-medium heat. Thinly slice the leeks and crush the garlic, then fry with the thyme leaves, stirring occasionally, for 10 minutes or until softened. Season well. Meanwhile, drain and rinse the cannellini beans, then cook with the orzo in a large pan of lightly salted boiling water for 7 minutes. Drain. 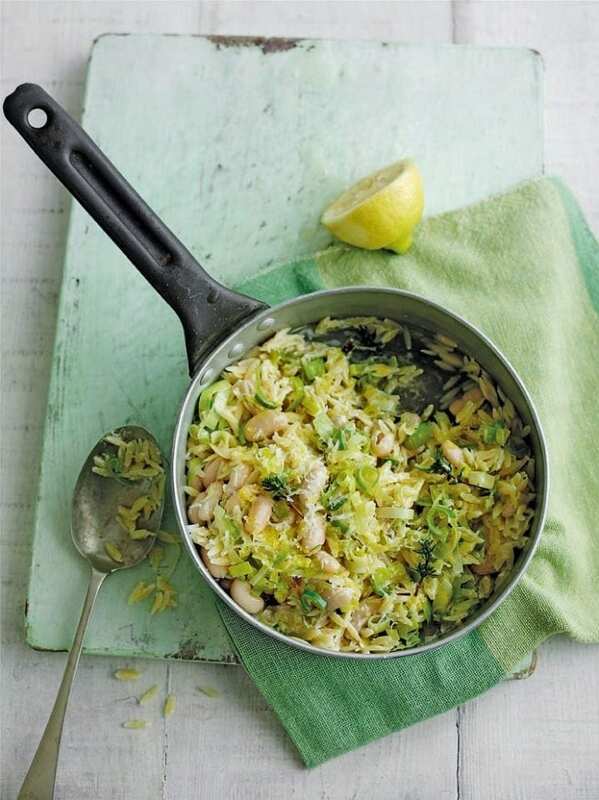 Squeeze in the lemon juice and scatter over most of the zest, then add the mixture to the leeks. Stir in the cream, taste and season. Serve scattered with the remaining lemon zest, the parmesan and some extra thyme leaves, drizzled with a little olive oil, if you like. Next time, use mini macaroni instead of orzo, and chicory instead of leeks for a bitter flavour twist.